"The authenticity of the video is being verified but no hope is lost. Efforts are being made to secure Fr. Tom's release. The best we can all do is pray for his successful release". In an appeal, the Salesians of Don Bosco said: “please do not give credence to reports coming from other sources unless the news has been confirmed by any of the primary sources listed. 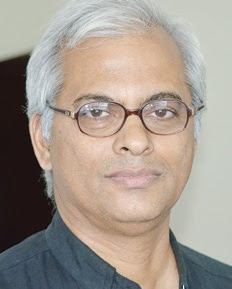 They have listed the information from The Ministry of External Affairs (MEA) of the Government of India, Archbishop Paul Hinder OFMCap, Apostolic Vicar of the Apostolic Vicariate of Southern Arabia (AVOSA) which includes Yemen, The Provincial / Provincial Secretary of the Salesian Province of Bangalore to which Fr Tom belongs and The General Council of the Salesian Congregation based in Rome only as credible primary sources to distinguish the authentic reports regarding the situation of Fr Tom Uzhunnalil, from the rumours doing the rounds. Please continue to pray for Fr. Tom. This morning Antonio Spadario S.J., a senior protagonist of the adulterist position has, but a few minutes ago, tweeted an interview from 2015 with Cardinal Schonborn, in which the Archbishop of Vienna expresses support for the adulterist position, as well as seeing "good" in homosexual relations. This Cardinal has been selected to present on April 8th, the 200 plus page Apostolic Exhortation on the chaotic Synod of the Family from last Fall, 2015. Readers will recall how not a few cardinals and bishops during the Synod openly supported adultery and homosexuality. The infamous Cardinal Maestrojuan of Panama was perhaps the low point amongst the numerous outrages, when he even proposed replacing the law of Our Divine Lord with that of Moses. Thank God, he was publicly rebuked by the Greek-Melkite Patriarch Laham. This is what we are dealing with: open heresy. Cardinal Maestrojuan's blasphemy at the Synod: "...could Peter not be as merciful as Moses"
The months following the Synod have not seen the adulterists silent. Indeed, they are ever active, determined to try to impose on the Church the "Christological heresy" (Cardinal Muller's words) of Holy Communion for adulterers. If successful (albeit under a false pastoral praxis), they will undermine not only the Holy Eucharist, but the Sacrament of Penance as well. Dear friends: be prepared. Be prepared for what Vox Cantoris has consistently been writing and warning us about. Do not forget, we are not dealing with legitimate pastoral practice or changes, we are dealing here with heresy. Part of the reason why these recommendations are so bad is the lack of forceful push back as evidenced in the presentation before parliament by Cardinal Collins and Larry Worthen. Weakness only emboldens the advocates of evil, of death. My own belief is that this "two steps forward", may be pealed back to "one step". We will end up with, what Mary Wagner calls the "terrible compromise" of "The Proposal" (an agreement between the CMA and a number of groups, about which I have written about a number of times); pretending that referrals are not referrals. Look for some sort of "non-referral" referrals agreement to be made acceptable for all. The Canadian Medical Association is making noises that it dislikes the present recommendations, and - obviously - wishes a return to a "Proposal" like compromise. No doubt, part of the CMA's concern is older physicians retiring, especially oncologists etc. Readers will note that Recommendation 11 is a declaration of war on Catholic hospitals. At first glance, one is repulsed by this and wish it be removed from the table. However, are Catholic hospitals really Catholic? St. Michael's Hospital in Toronto has been sterilizing women for decades; distributing contraception. St. Joseph's in Toronto has been sterilizing, and likewise distributing contraception. Abortion referrals also happen. These hospitals are are not Catholic. Perhaps it may be best to allow Recommendation 11 to be accepted by Parliament, forcing "Catholic" hospitals to - as the saying goes - fish or cut bait. As Mary Wagner wrote: "...the efforts of the Church here, and the medical profession, are not focused on outright resistance..."
Perhaps it is time they should be? Would we be even having such discussions if it were not euthanasia, but slavery or Nazi racial ideology that led to the gas chambers? How we have become so desensitized to evil! A report from Abu Dhabi indicates that Fr. Thomas Uzhunnalil, abducted by Islamist terrorists (either ISIS or an affiliated Sunni group) on March 4th of this zear, may still be alive. 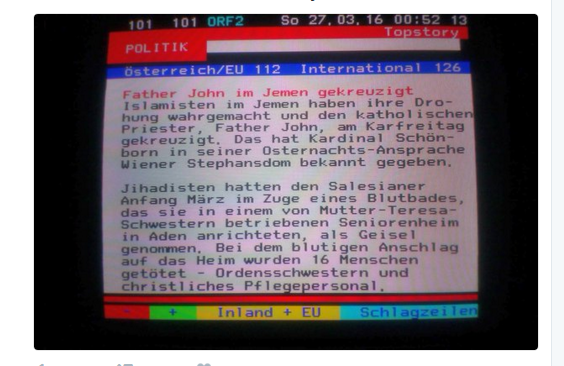 This blog had reported, based on information from a public statement of Cardinal Schönborn made during the Holy Saturday Easter Vigil, at the Stephansdom in Vienna, that Fr. Tom had been crucified on Good Friday. Bishop Paul Hinder, of the Apostolic Vicariate of Southern Arabia has said this is not true. 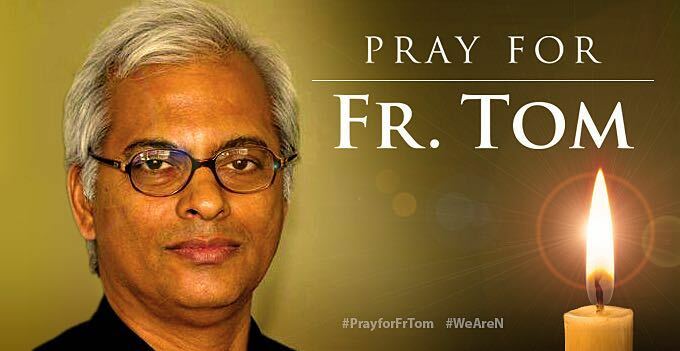 Let us continue our prayers for Fr. Tom, and for the softening of the hearts of his abductors. Let us praz for their conversion. 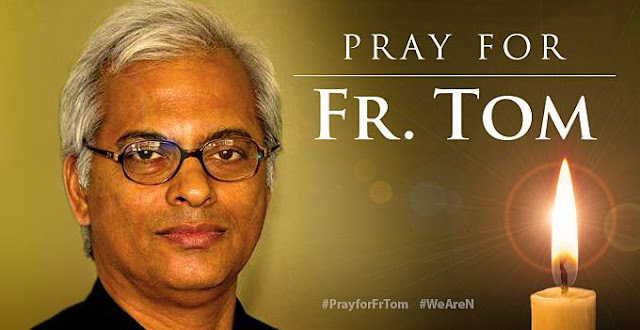 A spokesperson for the cardinal yesterday admitted that while he did say that the priest had been crucified, he had no confirmation of Father Thomas' fate. 'The cardinal based his statements on news published on Arabic language web sites. The validity of this information has, however, not been confirmed,' said Archdiocese Vienna's head of media relations, Michael Prüller. 'The cardinal doesn't himself have any sources that have confirmed the death of Father Tom. 'Thus, for the time being, there's still basis for hope that Father Tom is alive,' said Prüller. Following the news reports of Cardinal Schönborn's Easter Vigil announcement that Fr. Thomas Uzhunnalil had been crucified by Islamist terrorists (very probably ISIS, or other affiliated Sunnis), a number of statements have been issued by the Salesian Order and the Archdiocese of Vienna. It is to be noted that the Archdiocese of Vienna does not retract the claim of Salzburg.com and Polish investigative journalist, Witold Gadowski, that the Cardinal did indeed make a public statement that the Indian priest was crucified. Cardinal Schönborn had also just returned from the Middle East, having been to Iraq. If the Cardinal did not make this public pronouncement, we would have heard from him with a press release - a direct quote. But we have not. Indeed, Mr. Gadowski firmly holds to his account of the Cardinal's claim. Father John [Tom] in Yemen Crucified. Islamists in Yemen have made true their threat and have crucified the Catholic priest Father John [Tom] on Good Friday. Cardinal Schönborn announced this during his Easter Vigil address at St. Stephen's Cathedral. We can therefore conclude that Cardinal Schönborn did indeed state publicly during the Easter Vigil that Fr. Thomas Uzhunnalil was crucified. All of this is clear evidence in the face of misleading information spread by (e.g.) 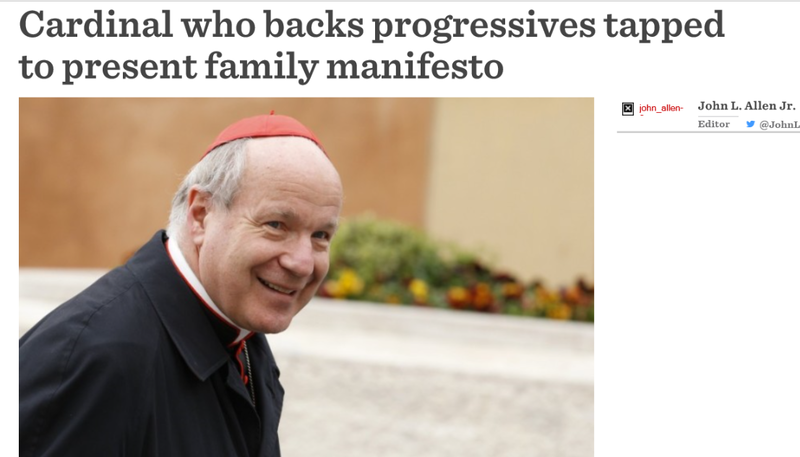 the Catholic News Agency such as this: "the original reports were based on a statement Austrian Cardinal Christoph Schönborn of Vienna allegedly made during Easter vigil services". No, it was not "allegedly made" - it WAS made. Bishop Hinder, Fr. 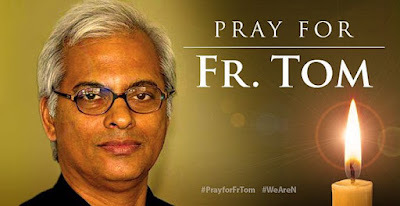 Tom's Ordinary for the region, according the the Archdiocese of Vienna, is alleged to believe that Fr. Tom is still alive: "so far no one has provided reliable evidence". Asia News carries a report. It should be noted however, that Bishop Hinder himself does not provide any details. Sadly, we simply do not know. The Asia News - and other official Catholic media - claim that Cardinal Schönborn has issued a clarification about his public announcement during the Easter Vigil. No he has not, for the reasons given above. Obviously we should hope and pray that Fr. Tom is somehow alive. But we should not also delude ourselves into wishful thinking. The truth must be sought, disinformation cast aside. Trying to downplay the grotesque and macabre evil that Islamism is a frightful self-deception. The danger of Islam must be confronted. A final note. One has to be very careful as to not just what the official Catholic media says; but, more importantly, what they do not say. Much of the official media's actions, motivations, and media spin is influenced by a false ecumenism towards the false religion of Islam. Remember this is the same media that tried - unsuccessfully - to hide the disaster of the Extraordinary and Ordinary Synod of the Family. 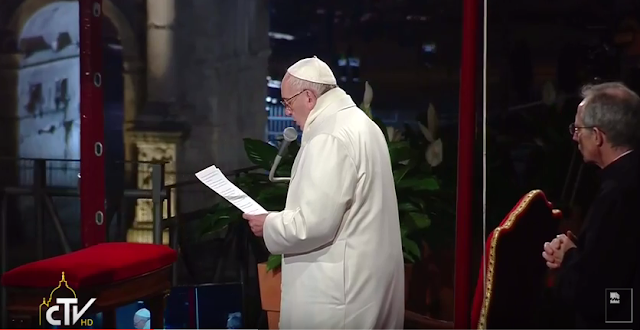 The official Catholic media did not report the outrages, blasphemies and heresies being uttered and promoted by a number of bishops and cardinals. This is the same media that continues the disgraceful silence and coverup regarding the growing homosexual scandal in the Archdiocese of New York. The "Coalition for HealthCARE and Conscience" ~ it has a "Proposal": when will it be made public? We have a proposal that will respect the conscience rights of doctors and healthcare facilities, without interfering with the patient’s choice for assisted death. Under this proposal the government would create a process allowing patients to directly access an Assessment Advisor who could provide resources and support to patients and connect them to physicians and facilities that provide physician-assisted suicide or euthanasia. The patient would have the option of directly accessing this service or seeking a transfer of care to another physician. Patients who request this procedure at a facility that does not provide it could be transferred to another facility. A question: where is this Proposal? How can Christians and others of good will support something they have not read? It is not a good sign to read "...the patient's choice for assisted death". Here we have language that is already equivocating, using the language of euthanasia. No! Language matters! We all know about "The Proposal"; a disastrous "terrible compromise" (to quote Mary Wagner, who dwells in the Vanier Centre for Women for active resistance to the evil of abortion in Canada) that has since been quietly removed - or has it? 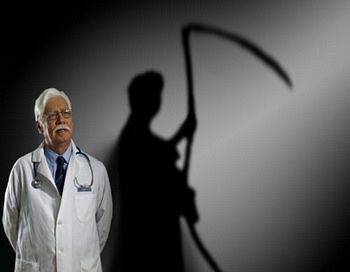 - regarding health care providers and imminent legalisation of euthanasia in Canada. "The Proposal" has yet to be retracted as error by the various groups that authored and supported it. I came to this country in 1969 after exhausting my appeals for conscientious objector status in the U.S. military draft. Quite simply, I objected to the killing of another human being on moral and religious grounds. Your father's immigration policies allowed me to find refuge in Canada, where I eventually took up citizenship. Unfortunately your policies regarding physician assisted suicide place many doctors and nurses in the same position I was in. They are being asked to be complicit in the killing of patients who request the assistance of a doctor in committing suicide. Just as I was a conscientious objector to killing, so also are these doctors, nurses and health care professionals. These people should not be asked to risk everything in order to do what they believe is morally right. I suggest you might honor your father's memory by not requiring conscientious objectors to participate in any way with any medical procedure or referral which would result in the killing of any human being. These protections ought to be enshrined in law. 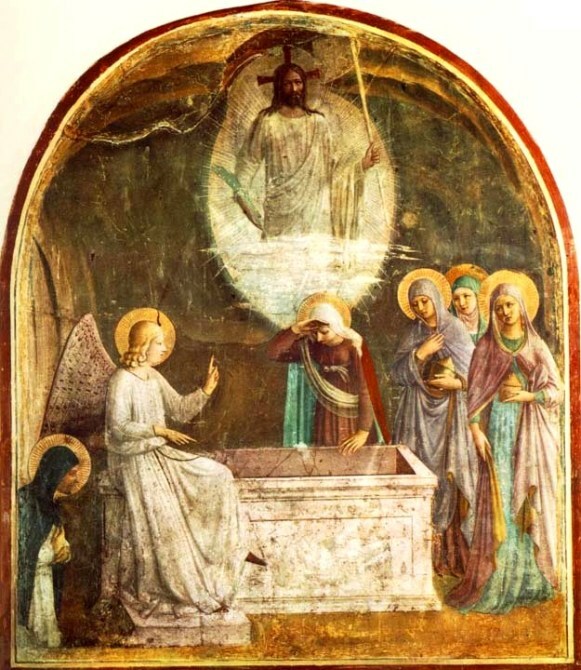 Christ is Risen - Truly He is Risen: a Blessed and Holy Easter to all our readers ! O Cross of Christ, today too we see you in those who wish to remove you from public places and exclude you from public life, in the name of a pagan laicism or that equality that you yourself has taught. Note: the 7th paragraph was kindly translated for this blog by a native Italian speaker for greater accuracy. Full text may be read here. Then delivered he Him therefore unto them to be crucified. And they took Jesus, and led Him away. And He, bearing His Cross, went forth into a place called the place of a skull, where they crucified Him." 1. Successes have terrible power to cast down or draw aside those who take not heed. Thus the Jews, who at first enjoyed the influence of God, sought the law of royalty from the Gentiles, and in the wilderness after the manna remembered the onions. In the same way here, refusing the Kingdom of Christ, they invited to themselves that of Cæsar. Wherefore God set a king over them, according to their own decision. When then Pilate heard these things, he delivered Him to be crucified. Utterly without reason. For when he ought to have enquired whether Christ had aimed at sovereign power, he pronounced the sentence through fear alone. Yet that this might not befall him, Christ said beforehand, My kingdom is not of this world; but he having given himself wholly up to present things, would practice no great amount of wisdom. And yet his wife's dream should have been sufficient to terrify him; but by none of these things was he made better, nor did he look to heaven, but delivered Him up. And now they laid the cross upon Him as a malefactor. For even the wood they abominated, and endured not even to touch it. This was also the case in the type; for Isaac bare the wood. But then the matter stopped at the will of his father, for it was the type; while here it proceeded to action, for it was the reality. And He came to the place of a skull. Some say that Adam died there, and there lies; and that Jesus in this place where death had reigned, there also set up the trophy. 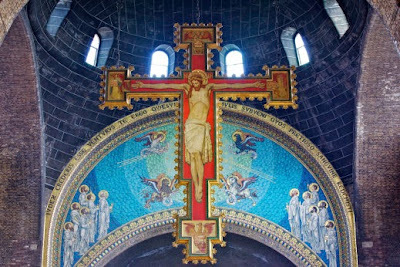 For He went forth bearing the Cross as a trophy over the tyranny of death: and as conquerors do, so He bare upon His shoulders the symbol of victory. What matter if the Jews did these things with a different intent. They crucified Him too with thieves, in this also unintentionally fulfilling prophecy; for what they did for insult contributed to the truth, that you may learn how great is its power, since the Prophet had foretold of old, that He was numbered with the transgressors. Isaiah 53:12 The devil therefore wished to cast a veil over what was done, but was unable; for the three were crucified, but Jesus alone was glorious, that you may learn, that His power effected all. Yet the miracles took place when the three had been nailed to the cross; but no one attributed anything of what was done to either of those others, but to Jesus only; so entirely was the plot of the devil rendered vain, and all returned upon his own head. For even of these two, one was saved. He therefore did not insult the glory of the Cross, but contributed to it not a little. For it was not a less matter than shaking the rocks, to change a thief upon the cross, and to bring him unto Paradise. BREAKING: Pope Francis will break his own new rules for the "Rite of the Washing of Feet"
Vatican Radio carries a report from L'Osservatore Romano that our apotheosised Holy Father, Pope Francis, will violate the new rules for the "Rite of the Washing of Feet" (also known as the "Mandatum"). Pope Francis will celebrate the Mass of the Lord’s Supper on Thursday at the Centre for Asylum Seekers (Centro di Accoglienza per Richiedenti Asilo, or CARA) in Castelnuovo di Porto, located 25 kilometres north of Rome.The ceremony on March 24th will involve Pope Francis washing the feet of young refugees. 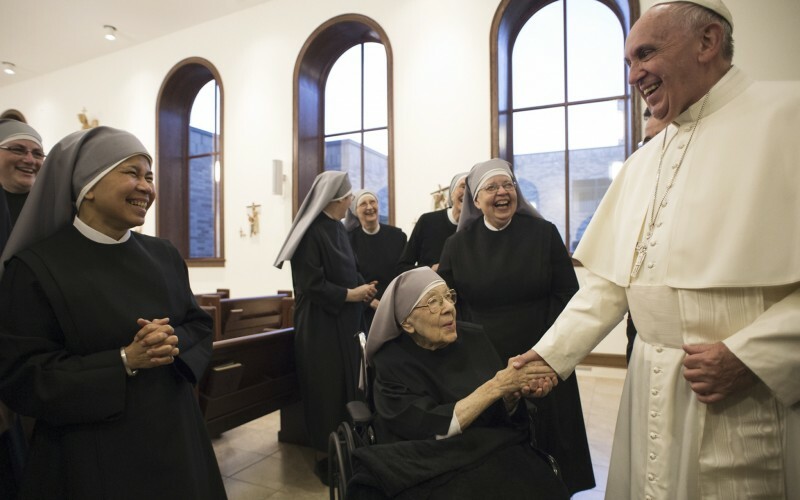 The Holy Father's new Decree is specific: only those who are "the people of God" may be chosen. That is, those who are incorporated into Christ through baptism, as sons and daughters of Christ's only Church. If our esteemed Holy Father cannot keep and set the example of obedience to the rules of Holy Mother Church - what kind of a signal is he sending to his bishops and priests? Why even undertake the writing of a new set of rules, if these very same rules will be cast to one side by our venerated Holy Father? One must wonder what the purpose of drawing up the new rules were? Particularly, since the Supreme Lawgiver, our revered Holy Father, is casting them aside as quickly as they were written. Canonist Ed Peters comments that papal violation of Church Law does not abrogate same, but renders the law moot. Papal disregard for law, leads to chaos. The Holy Father places before Catholics a very bad example of humble submission to obedience. There are reports on the internet that suggest the captured Salesian priest, Fr. Thomas Uzhunnalil, may be crucified this coming Good Friday. No one knows. Certainly it is possible: inspired by Satan, ISIS has a flair for the most demonic and grotesque acts of horror and brutality. Please pray for Fr. Thomas. Pray to the saintly sisters, now receiving their eternal reward. Please pray for the killers, that they repent, surrender themselves to the authorities. Pray they convert and abandon the false religion of Mohommed. The former Mayor of Toronto, Rob Ford died this morning after a long battle with cancer. He was 46. 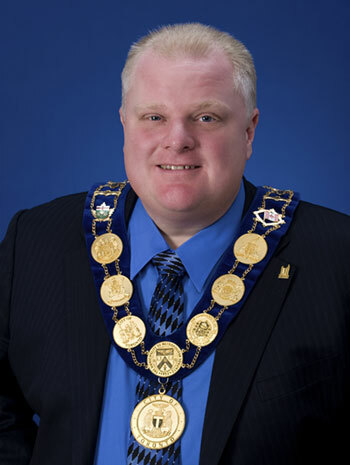 Please pray for the soul of Rob Ford. Eternal rest grant unto him O Lord, and may perpetual light shine upon him. May he rest in peace. Amen. 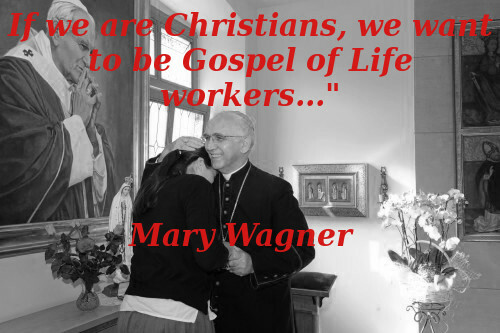 We can now inform our readers and those who support the extraordinary Gospel of Life work and resistance of Mary Wagner and Linda Gibbons, that Mary's court challenge before the Superior Court of Justice (Toronto Region) - originally set for May 16th, 2016 - has been delayed and will now be held in September with a date to be yet determined. There have been delays in transcripts ordered from previous trials, which have caused the change of date. 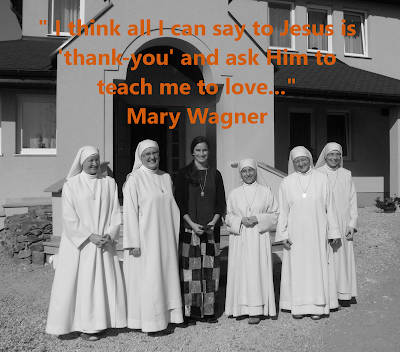 Please keep Mary, our dear sister in Christ - especially during Holy Week and over Easter - in your prayers. The Canadian euthanasia train was roaring down the track for years and it was all but ignored by the "conformist Christians"
"Silence in the pulpit is a scandal. Mary [Wagner] is doing the heavy lifting for the conformist Christians. In other words, going along to get along. Their actions expose them for coexisting with a death culture..."
Will Canada march down the path of a "horrible compromise" ? The blog Contradiction points out that Ian Hunter gave a prophetic lecture back in 1998 on the expansion of evil in Canada, and that euthanasia was high on the agenda. He was ignored; opposition to euthanasia by churchmen, politicians, physicians and others was basically comprised of ignoring the issue. Finally, when the euthanasia death train could be heard roaring its way into Canada in 2014 and 2015, the "opposition" tactics became one of "horrible compromise", to use Mary Wagner's phrase. A leave us alone while you go about your dirty business of killing attitude was trotted down to Parliament Hill by a number of euthanasia opponents. Sensing great weakness, the Committee struck back with aggressive demands on health care providers and all publicly funded health facilities, such as nominal Catholic hospitals (e.g. St. Michael's and St. Joseph's in Toronto - both well known for providing sterilization and contraception for decades). Or, will Canada oppose evil with "active resistance" ? A real fear - a VERY real fear, is that the Committee may back off this demand (the classic two steps forward, one step back) and settle for the typical Canadian approach to abortion. No one is forced to have one, but we will have wide open killing, with any resisters quickly bustled off to jail. No one can be allowed, or even seen questioning Canadian "niceness" when it comes to "legal" murder. In fact, Mary Wagner was accused of a "certain lack of kindness..." by prosecutor Tania Monteiro for suggesting to expectant mothers not to kill their unborn children. This is the type of madness that has gripped the pro-death Canadian mind. It is this pro-death mind, of nearly 50 years of slaughtering the unborn that is fueling the euthanasia death train that has just roared into the station. Be prepared for a "horrible compromise" with nominal Catholic hospitals, and "conformist Christians". Be prepared for comfort, not resistance. 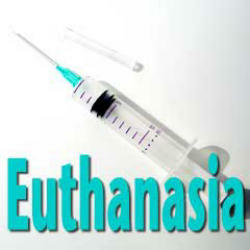 Be prepared for these nominal Catholic institutions, though officially not providing euthanasia, turning a blind eye as they do with the "wink-wink, nudge-nudge" abortion referral technique. Be prepared for what Linda Gibbons calls "conformist Christians" to maintain their lives of surrender and no resistance. Already this conformism can be seen in language employed. I have noticed that the Catholic Register is using "assisted suicide"; others are using similar language and inconsistent language. The Coalition for Healthcare and Conscience also not infrequently uses "assisted death", "doctor-assisted death", etc. Not a good sign at all - in fact, a very bad sign of surrender. It is one that is primarily focused on protecting its members and not stopping the advance of the anti-culture of death. Bishop Fellay: is it time for the SSPX to change Superiors? It would seem that Pope Francis is not the only one capable of giving a disastrous interview. 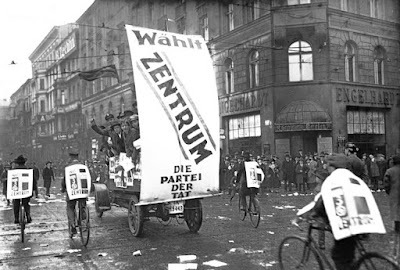 The leader of the Society of St. Pius X comes off terribly in an interview with Tim Sebastian of Deutsche Welle. I wonder why this interview has not been covered by the Catholic media? After all, the Pope's various controversial interviews have been. An example: a great many hear about the papal comments from the back of a plane, but few have heard about Fellay's interview. This interview really brings into question Bishop Fellay's competence and leadership. A bishop should be able to handle, tough - even harsh, provocative and yes - dishonest and confrontational questions from a secular journalist. It may be time - after 22 years! - for the SSPX to consider changes to her leadership and not wait until 2018. It may also be time for us to take off the rose coloured glasses and to look at the Pope and Bishop Fellay through the same lens. If the pope makes mistakes in the back of an airplane, it is fair to point them out; but it is also equally fair to point out the mistakes of the SSPX Superior. Yesterday, on the Feast of St. Joseph, Bishop Richard Williamson, consecrated Fr. Thomas Aquinas the second bishop of the "resistance" without a papal mandate. Williamson, expelled from the Society of St. Pius X, has been an open critic of the Society's leadership, especially Bishop Bernard Fellay. 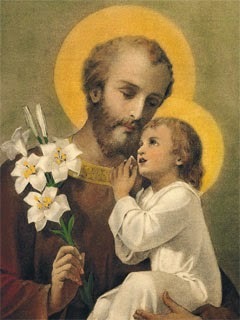 Happy St. Joseph's Day: "the just man shall blossom like the lily"
Dear readers, May the holy Patriarch, the ever-virginal and most pure Husband of the blessed Virgin Mary bless you, on this his Feast Day. 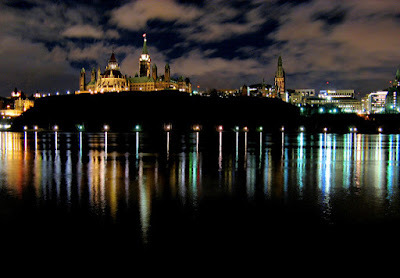 May all Canadian readers intensify their prayers to the Patron of Canada, that he may, through his intercession before his foster-Son and his ever-Virgin Spouse, bring Canada healing and conversion. It was a cool, cloudy and foggy day for the conclusion of Mary Wagner's trial in Toronto. A drive in the prison van from Milton can take up to two hours to get through rush hour traffic into downtown Toronto. Both Mary and Linda Gibbons have in the past been transported in freezing vans with the heating turned off in the prisoner compartment. Just last January, Linda - only in her Vanier "greens" - on the way to court, was trapped in one of these sadistic ice buckets in minus 10 degree weather. Yesterday at the Old City Hall courthouse, in Room M2, Mary's trial resumed at 10:57 a.m. before sixteen supporters - including Linda. Mary was led in, handcuffed, holding a small copy of the New Testament. Prior to the commencement of the trial, Crown prosecutor Tania Monteiro, asked that the video evidence be placed under a "temporary sealing order" at the conclusion of the trial. The final witness, Policewoman Emma Morley, was called to the stand. She stated that she received a radio "call for trespass", at 9:55 a.m, on December 12, 2015 and that it was at "a woman's clinic". Morley significantly admitted "it was not a priority call". At 10:04 a.m., Morley arrived to find P.C. Keegan already on the scene. "We entered the building... we waited for each other on scene and we went in together". "P.C. Keegan knew where to go...it was on the 4th floor". In the hallway - leading to that unit [the abortuary] - I observed flower petals strewn on the floor... there was a female there with a camera taping...we buzzed to get in". Morley continued her testimony: "staff members there; they pointed out the lady over there...just to indicate who it was, as there were multiple people in the clinic at the time". Morley said that Keegan "...had dealt with her in the past; that is Mary Wagner". I noticed that as Morley continued, Mary was quietly reading the New Testament; I glanced at my watch, it was 11:12 a.m. Morley continued: "we go over and speak with her... would she come with us, she needed [she emphasized] to come with us. There was no response. I grabbed - I took her elbow and then she cooperatively came with us". Morley then said that she and Keegan escorted Mary "...outside the building, close to the sidewalk". They informed her "...that she had trespassed and if she returned she could be arrested". "We stood by for a little bit...eventually we did leave". Morley testified that after this, she returned to her squad car to write up her report. Morley continued with her testimony that shortly after this she "heard on the radio that Miss Wagner had returned to the clinic and staff asked us to re-attend". When Morley arrived on the scene, she testified that "P.C. Keegan was already coming out with Miss Wagner arrested". "Keegan arrested her", Morley affirmed. Morley then spoke about alleged probation violations, "P.C. Keegan said "she was on conditions". Morley told the court that she followed Keegan back to Division 11, who had Mary in his squad car. Mary was taken to an interview room. So concluded Morley's testimony. Crown prosecutor Monteiro began her :"respectful submission...Mary Wagner should be convicted... the evidence is overwhelming...as captured on the surveillance video...it was a woman's clinic that performed a number of lawful medical procedures....the staff had to use their own bodies to stop Miss Wagner for dialoging with women...pushing Miss Wagner, pulling Miss Wagner...Dr. Lupovici fell over backwards...they are lawfully doing their jobs...[for] personal and intimate medical procedures". Monteiro claimed that they were "treated with a certain lack of kindness by Miss Wagner". Monteiro complained that Mary allegedly spoke to the expectant mothers, "...something to the effect of murdering your babies. I would respectfully submit the opposite". The Crown prosecutor droned on: "These women are using the property for lawful processes...for which they have a right". "She very deliberately interfered with these women from continuing in their medical needs". As Monteiro droned on, I could not help but notice that Mary quietly continued her scriptural reading, as the political show trial continued. Monteiro lamented: "women eventually gave up. They had to wait for the police...retreat back...trying to do their jobs [and to] continue lawful use [of the abortion facility]." "Miss Wagner tried to re-engage with a new patient. Women and staff did everything they could to go about their business. Police arrived....Then Monteiro continued outrageously, "Miss Wagner was generally non-violent". Monteiro continued her sad monologue: "we heard Miss Wagner was not welcome there...Miss Wagner is not allowed in that clinic for a number of reasons...she managed, notwithstanding to gain entry into the clinic... she spent approximately eighteen minutes there... it was an interference with lawful use of that clinic. Staff were upset...some women left". "It may be presumed that they abandoned their appointment. That amounts to mischief". Monteiro tediously went on: "there was a degree of violence...the patients became distressed...they had to secure them away...staff started to take physical action against Miss Wagner". "Ostensibly Miss Wagner appears non-violent, undeterred, she re-enters...I can only presume she was hoping for another patient...luckily staff could observe [her]....Keegan found her in the elevator lobby". Monteiro asked that Judge Mulligan convict Mary of the mischief charge and two counts of violation of probation. It was here that the Judge informed Monteiro that she was throwing out the probation charges, as " I don't have any evidence that Miss Wagner's date of birth came from her". The Judge was not satisfied that the Probation Officer had adequately identified Mary in the courtroom. Judge Mulligan continued:"I can't accept that date of birth...we have an issue...I am also mindful that Miss Wagner did not enter a plea". The Judge then called for a morning recess and stated: "I want to deliver [the ruling] this today". Following the recess, Judge Mulligan delivered her verdict. Mary was found guilty of the mischief charge, and not guilty of two counts of violation of probation. The Judge said that Mary "...entered surreptitiously, by sneaking in; well aware of her status as not welcome...refused to leave...she stay uninvited. Miss Wagner only left when she was removed", and that she"...interfered with the lawful operation [of the clinic]". The Judge also stated "...some patients left". She further corrected Monteiro regarding criminal law, informing her that the charge of mischief is not a super summary offense, and that the maximum is six months, not nine which Monteiro was seeking. As to the two allegations of probation violation, Mulligan threw them out stating: "Miss Wagner did not enter a plea... there is no admissible evidence to compare her date of birth to the probation orders. I find her not guilty of these two charges". The Judge then ordered the video evidence sealed; patients faces "...must be obscured if the tape is released". Monteiro then stated she would "seek to tender Miss Wagner's prior record". "I will be seeking to prove them". Seeking an adjournment, Monteiro tried to elicit from Mary an admission to her previous record, showing her a number of documents. Mary remained silent. She further attempted to entice her to speak by stating that a "defense counsel would ask for time served" and that Mary could be released as she was attended at court with a "supportive community". Mary did not fall for this manoeuvre. After some discussion, the Judge decided that the next hearing will be April 25th at 10 a.m. in Room 112. As of yesterday, Mary has spent the equivalent of 144 days served, based on a calculation of 1.5, as she has refused bail. Barring any unforeseen happenings, Mary should be formally sentenced and then released with "time served" (and about two weeks extra) on April 25th, the Feast of St. Mark. Mary, lovingly, we keep you in our prayers. May God be with you, as you enter Holy Week, and may His Mother protect you with her maternal mantel. Dear friends, please continue to keep Mary in your prayers. Please especially pray for her and her intentions during Holy Week. We will be organizing another "Rosary Bouquet" for Mary that will conclude on Divine Mercy Sunday. Details to follow.